Okanagan Heat fans can look forward to another season of fierce competition in 2013-2014. The most exciting news this coming year for athletics, and one that will a tremendous impact on the entire UBC campus community is the opening of the brand new fitness facility, dubbed ‘The Hangar.’ In use since June and with an official opening on September 17, the state-of-the-art facility has been outfitted with new equipment and exercise machines over the summer. The Hangar Fitness and Wellness Centre is made possible through a donation on behalf of Barry Lapointe and Mary Jo Schnepf and their family. The Hangar offers 35 cardio machines with interactive goal setting and internet capabilities, a fully equipped weight room including resistance machines, free weights and functional training equipment as well as a stretching/regeneration area. Our two fitness studios feature classes such as Yoga, Zumba, Bootcamps and Spin with more than 20 classes running per week. Once again UBC’s Okanagan Heat athletics had a successful and historic year in 2012-13. In their sophomore season as members of Canada West the basketball and volleyball teams continued to play well, and the results showed up in the win column. The four teams improved by nine wins combined with the women’s volleyball team qualifying for the postseason in the incredibly competitive women’s volleyball conference of Canada West. This success on the court enabled the UBC Okanagan Heat to complete their probationary period and become full members of Canada West in May and then full members of Canadian Interuniversity Sport (CIS) in June. Not only did more than 120 student athletes put forth great effort on the court, field, pitch, and course over the year, students also once again took great pride in continuing to be an active part in the local and campus communities. Large scale events like Wendy’s DreamLift, Adopt-a-Road, the Food Bank’s Stuff a Bus campaign were once again supported by Heat athletes giving their time. You could also see a strong Heat presence at the Parkinson Super Walk, the Terry Fox Run, or at local schools with the Read-to-Achieve program. Heat athletes even also helped first year students carry boxes to their dorm room during Rez Move-in. You would also see many of the players and coaches giving time in their areas of expertise – many of them spent time coaching in youth leagues and clubs, at summer camps, inspiring many young athletes to play with passion and skill while showing how far a sport can take you in life. The varsity teams also utilized many of their home varsity games to help support great causes. Soccer coaches participated in the Go Shoeless, campaign, the CIS Shoot for the Cure and KidSport. Once again the time given back to the community by our student athletes totaled hundreds of hours. 2012-13 was another exciting year for Heat soccer as both teams tried to better their provincial medal performances from a year prior. Under the steady guidance of veteran coaches Claire Paterson and Dante Zanatta, strong team cultures continued to propel players towards their goals. After opening their season with a loss, the women’s team would not lose another match, posting a 7-1-6 record and qualifying once again for the PACWEST championships. Ultimately, they would fall to valley rival Thompson Rivers University to achieve a silver medal in back-to-back seasons. A season-long struggle on the offensive end plagued the men’s team, who did not qualify for the playoffs after going 2-7-5 for the year. Several narrow 1-0 losses and 1-1 ties would haunt the Heat as they fought for a chance to improve upon their bronze medal performance the past season. With only a couple of players graduating, the team will have a lot of experienced players returning this year, hoping to make a splash and get back to the dance. Paterson and Zanatta will be entering their sixth and third year of coaching, respectively, as they go for one more round of PACWEST action before their teams make the jump from the college league to Canada West. The Heat soccer programs were officially accepted into Canada West at the league’s Annual General Meeting in May. The teams have unfinished business, though, as they try for one more shot at provincial glory, and hopefully the national championships. See the latest recruits for Heat soccer here. Soccer opens its season at home on September 7 versus the Vancouver Island Mariners. It was a breakout year for coach Steve Manuel and the Heat women’s volleyball team. After a tough rookie Canada West campaign, the Heat came out with force during the 2013-14 season, catching many teams by surprise and making the playoffs. The first round was a date with destiny as the Heat hosted Canada West newcomer Mount Royal for a matchup of the ages. The Cougars prevailed, but the Heat proved they were here to stay. Perhaps the biggest surprise for the Heat was how quickly rookie setter Emily Oxland became a star in the league, becoming a Canada West All-Star and CIS All-Rookie team member after a sensational first year. Bench boss Steve Manuel, in his 13th year at the helm, also collected Coach of the Year for both Canada West and the CIS. The men’s team suffered a huge blow when former Canada West All-Star hitter Nate Speijer underwent an emergency appendectomy that would sideline him for the rest of the season. Without his firepower the Heat often struggled on offense other than several valiant performances by the graduating Riley McFarland, including a 56-kill weekend in Regina for the team’s only two wins of the season. With Nate back and healthy next year and a wealth of developing younger talent, the men are hungry for a return trip to the playoffs. Both teams have once again recruited the top high schoolers across Western Canada and are bringing in impressive recruiting classes. Men’s coach Greg Poitras and Manuel will have their teams ready for the season opener on Friday, October 26 in Kamloops and will have their home opener versus the WolfPack the next night. In their sophomore season, the women’s and men’s Heat basketball squads improved their season records by three and six wins, respectively, in a highly competitive Canada West conference. The past season was a breakout year for a youth-laden roster of the women’s team. Improving to 6-16 in just their second year in Canada West, the team used a fast-paced style with lots of pressure defense to combat teams who were usually bigger and stronger. Graduating forward Roslyn Huber set a new career scoring record for the program with 899 points, breaking Jenna Kantz’s 861 points on the road at Trinity Western University. 2013-14 will mark women’s coach Heather Semeniuk’s 20th year at the helm of her squad, which boasts a heavily youthful roster after the departures of Huber, Melissa Irish and Madison Kaneda. The hard-working culture that Semeniuk has infused into her team really shows in her players, who will look to better themselves again this season. A new culture came to town for the men’s basketball team too, as new head coach Pete Guarasci came to the big seat. Pete’s hard-nosed defensive ways took his team and the league by storm as the men fought doggedly game-in and game-out on that end. A lack of consistent offense was often the burden for this young and undersized Heat team. Still, the future is bright for the men who have another year with the very potent backcourt of fifth-year Yassine Ghomari and sophomore Mitch Goodwin, who consistently make impact plays at both ends. As always, the coaching staffs have been hard at work building this year’s recruiting class. Heat basketball opens at home November 1 and 2 when they host a pair of prairie teams in the Alberta Bears/Pandas and the Saskatchewan Huskies. It was a big year for Heat golf, with the women’s team of Alana Kent, Jessica Kozak and Jen Woods cleaning up at the CCAA National Championships to bring home the title banner. The women finished a single stroke ahead of the Holland College Hurricanes 501 to 502 to clinch it. Two men represented the Heat at nationals in William Deck and Cody Bell, who finished tied for seventh and tied for tenth, respectively, with final totals of 221 and 222 (5 back and 6 back). Woods had a stellar career in Heat uniform that added a couple of cherries on top as she was named co-Female Athlete of the Year for the Heat athletes and then also collected City of Kelowna 2012 Female Athlete of the Year honors. The Golf team will be introducing a new coach for the 2013-14 season, as the lead instructor at the World Beat Family Golf and certified Canadian PGA Instructor, Cass Hritzuk, hopes to build upon the success of the previous teams. The team will have its Qualifying Tournament at the Okanagan Golf Club August 18-19. Tee-off for the season-opener will be Saturday, September 8 at Morningstar Golf Course on Vancouver Island. Nationals this year will be held by St. Lawrence at the Royal Quebec Golf Club in Québec. The UBC Okanagan Cross Country team continues to grow and thrive under coaches Nate and Nikki Reiter. The women’s team finished fourth overall and the men fifth at this past season’s CCAA National Championships in Longueil, Québec. Nikki and Nate will use this year as a building block, the duo hopes to elevate the Heat Cross Country program into a full-fledged CIS program within a season or two. The Heat runners’ season will culminate with a trip to Toronto as the Humber Hawks will host the 2013 CCAA Cross-Country Running National Championship on Saturday, November 9, 2013. Once again the fledgling UBC Okanagan rugby program continued to make strides forward. The men’s 15’s squad once again hosted the Hindson Cup, only to fall in an extremely exciting match on a last second try by the University of Calgary Dinos. The Heat sent both a men’s and women’s sevens squad to an international tournament in Las Vegas, and the CIS championships in Victoria last spring. This year coach Rob O’Brien is once again working tirelessly to ensuring rugby is a strong part of Heat athletics for this season and years to come, the team will once again host the Hindson Cup in the fall and once again will have their season culminate at the CIS national sevens championships in the spring. 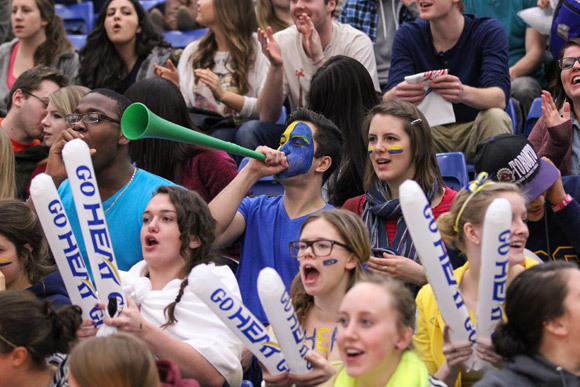 Another banner year for campus recreation at UBC, as more than 6,000 people participated in some sort of recreation on campus this past year, be it as a member of the facility or a participant in intramurals. Although rain hampered the Feed the Valley run this year, close to 250 people took part in the numerous special events offered via campus rec over the school year. Campus Rec with the growth of facilities and space will increase the fitness opportunities on campus, once again offering different types of classes, like Yoga, Zumba, and others. With the new facilities personal training offerings will also be increased as well as new options such as Spin. Other recreation opportunities will be offered via campus clubs, campus rec often partners with clubs on campus to facilitate recreational opportunities for the campus community. The campus has a strong Aikido club that trains twice a week, other sports such as squash have also be accessible through campus rec and clubs. Intramurals will once again offer volleyball, basketball, soccer, and will continue to add new sports as the interest and space allow. Sports added in the past few years include ultimate, dodgeball, futsol and flag-football. Large events and off-campus recreation is always popular, last year trips to Big White were arranged, fun learn-to-curl bonspiels were held, and partnered events like the Feed the Valley walk and run event. With the growth of the facility and the continued growth of the varsity teams, and varsity action here on campus it is no surprise that the level of service has also increased within the athletic department. With the size of the Hangar, its new equipment, and its dedicated rooms for fitness classes, and the obvious increase in usage from the campus community will require as person with special training and multifaceted skills. New to the university to take on this task is Heather Corliss, Heather is a certified athletic therapist (CAT(C)) with a Bachelor of Science degree in Kinesiology from the University of Lethbridge. Heather will be responsible for daily operation of the Hangar Fitness Centre; she’ll coordinate all of our fitness programming and will work alongside our Varsity Program’s Athletics Therapist to facilitate strength and conditioning for our Heat varsity athletes. Working closely with Heather in the running of the Hangar and the rest of the Facility, in a customer service role, will be Crystal Livingston. Crystal comes to UBC from World Gym Kelowna, where she most recently served as their general manager. Crystal holds a Bachelors of Science in Kinesiology from the University of Alberta, and will be responsible for the general operation of the Recreation Customer Service Desk, including program and membership administration and management of the student staff who work in that area. Coming from a six-year stint as the athletic therapist, and strength and conditioning coach with the Kelowna Rockets, Jeff Thorburn, will use his experience helping many young hockey players graduate to the NHL as he takes on that same role with the varsity athletes for the UBC Okanagan Heat. Along with his half-dozen years with the popular Kelowna hockey team Jeff has been therapist for many world class events. Most recently he was the therapist for Team Canada at the World Junior Championships, and at the CHL Prospects Game. Jeff is a certified Canadian athletic therapist (CAT(C)) with a Bachelor of Kinesiology (Athletic Therapy) from the University of Calgary. Andrew Meadwell, who started last September, will continue to grow and promote Heat on campus and in the community as the Varsity athletics Event coordinator. This being his second season in this role at UBC, you can look for Andrew to take the Heat to a whole other level of excitement and fan engagement. An exciting aspect that will help Andrew promote varsity events in the gym this year is the shiny new finish of the gym floor. Emblazoned with Heat branding and colors, the new gym floor, specifically the main court will inspire the Heat teams and enhance the fan experience, making game night a uniquely Heat experience. When the Hangar was in construction some of the grassy area adjacent to Athletics Court was excavate. Instead of replacing with grass, UBC decided this was a good opportunity to add more recreation space on campus. Opening in early September will be two outdoor beach volleyball courts available for the campus to utilize when the weather has you itching to be outside. Behind the Purcell residence, currently in the early stages of construction is more multi-use outdoor recreational space with the construction of an outdoor ball hockey surface. At the end of the season, the Heat bring in a speaker to headline their Athletic Scholarship Breakfast. This will be the ninth year for the event that is sponsored by Valley First Credit Union.